Tangram Chess is an excellent iOS game from the creator of MathFileFolderGames. This is a multiplayer game that has students trying to move shapes using: rotations, translations, and reflections across a chess board. The player to move their shape to the other side of the board first wins. Best of all, as w/ most MFFG this app is bluetooth enabled which means that two players can play on multiple devices. 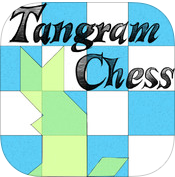 I highly recommend checking out Tangram Chess by clicking here!!! For more MathFileFolderGames click here. *MathFileFolderGames is an advertiser of Technology Tidbits.